Sometimes we just get tired of eating out and long for home style dishes that our moms use to make while growing up. 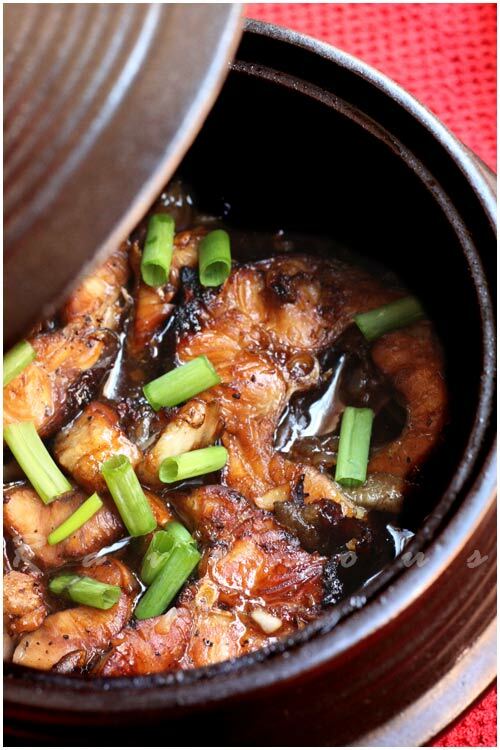 Nothing reminds us more of our childhood memories more then ca kho to (Vietnamese Braised Fish in Clay Pot). While pho may be a special treat to eat on occassional weekends, ca kho to is a dish that families routinely eat on a regular basis. The sweet, savory and gooey goodness of the caramelized sauce of this dish is almost good enough to stand on it’s own mixed with plenty of jasmine rice. In Vietnam, ca kho to is often cooked in a brown clay pot to retain heat and help in the caramelizing process, but this isn’t essential. We like to use our Korean stone pot, but any thick pan or dutch oven that retains heat will do just as well. Typically catfish is used, but really any variety of fish steaks can be used. Catfish is great for braising since it has a higher fat content, rendering it moist but still retaining it’s shape during the braise. Some recipes even call for braising some pork belly with the fish as well. You can use premade caramel sauce, but it’s easy to make your own. All you need is sugar and water or oil. For most recipes, you really don’t need much, about 2 tbs sugar and 2 tbs water or oil. Simply melt sugar in dry pot, stirring occasionally, then when it reaches a dark monogamy color, stop the cooking by stirring in the oil. 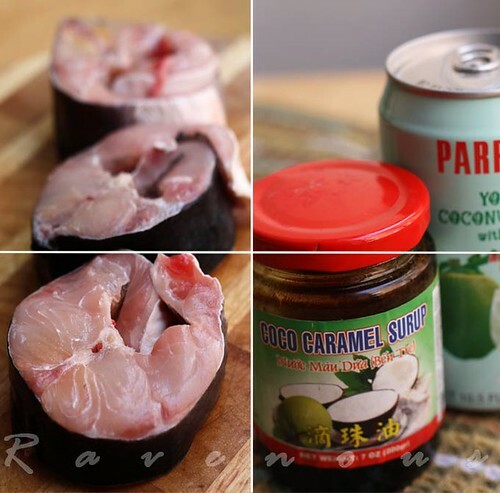 Braising in fresh coconut water is great and gives a subtly sweet sauce, but if it’s not available it, use canned ccoconut water or what my parents always used, coco-rico, an artificial coconut flavored soda, which honestly, wouldn’t be our first choice. choose a meaty fish steak such as catfish, king mackerel, tuna, or salmon. Directions are for making caramel sauce, but can be skipped if using premade-just add after searing the fish and just before the coconut water. Marinade fish with fish sauce, 2 Tb sugar, garlic, and shallots for min 10 min. In heavy pot such as dutchoven, heat 2 tbs of sugar on medium high and stir until sugar melts and becomes dark mohogany, immediately add the oil to stop caramelization and stir. Sear the fish steaks, turning once after it has browned. Add coconut water turn to med low heat to braise. Cover pot for 3-4 minutes for fish to cook through and then remove cover to reduce the sauce to about 1/2. Season to taste, with fish sauce or sugar if needed. Add optional chili and stir into the sauce. Finish with fresh cracked pepper, green onions. Serve immediately with white rice. What a lovely, nourishing, comforting meal! yum, this is one of my favorite things to make for dinner!! I really love Vietnamese food, but sometimes have a hard time finding recipes that seem "authentic" (as if I would know…ha) This looks delicious, thanks for sharing! I agree on the longing for the mom's dishes although mine would be be more of grandma dishes because she could cook and mom swears it skipped a generation. This reminds me I need to find a clay pot. Definitely something I want to experiment with. Anh: Thanks! Ca Kho To is just such a good daily meal. Joy: Ca Kho To is definitely one of the most popular Vietnamese comfort food. natalie: thanks for stopping by our blog and commenting! Sam: Authenticity is a hard thing to pin down as even in Vietnam, ca kho to recipes can vary by regional and personal preferences. Even in this dish as some use pork belly or ginger or lemongrass. jeff: clay pots are often found in asian markets for pretty cheap–but you don't absolutely need it to make ca kho to. A good dutch oven will be perfect. I was just talking to my grandma about this dish! I've made thit kho many times, but have yet to try my hand at ca kho. I know a clay pot isn't necessary, but it looks so stinkin' cool. Gastronomer: You'll be a pro at making this dish if you already know thit kho. We love our Korean stone pot since we use it for this and soon du boo. Wow, this looks amazing! Something like mom used to make Thanks for posting….will be trying as soon as possible! I always like claypot dish. I have never tried a Vietnamese claypot fish. This is definitely a must do dish to me! Thanks for sharing! anonymous: Let us know when you make ca kho to and how it goes! Ellie: We'll love to see your version of fish in clay pot one day. This sounds like the perfect recipe to get my partner to eat fish!! The braised fish sounds amazing! I'm loving the addition of caramel sauce! Glad to find your blog! Meagan: We'll love to know what work of art you would pair with this dish..
Ross: Thanks! We think the ca kho to tastes great too. 5 Star Foodie: Thanks! Anything caramelized is good. This method is also great for braising pork belly (thit kho) or chicken (ga kho). This looks heavenly! Gooey, sweet catfish? Nice! I think that I could improvise this dish with ingredients available in Japan. But the coco caramel syrup I might not be able to find. How could I improvise that? KyotofoodiePekoPeko: it's easy to make your caramel sauce. All you need is sugar and water. Use about 2 tbs of sugar and 1/4 cup and keep at a rolling simmer, stirring until it reduces and becomes dark brown, about 8min or so. It should be around maple syrup like consistency. If too thick, just add more water. That fish looks really tasty! Kevin: Thanks! Ca kho to is one of our comfort go to dishes. I tried this and it was great and easy. I might try again with a different type of fish. The catfish (frozen yellow catfish) I used has a lot of small bones. Any suggestions on what I can replace with? This is insanity!!! Your blog always makes me hungry!!! Please spare me some mercy!!! I Totally Love this dish, although I think I usually devour the rice and the sauce a little more! Strange! Well thanks again for making me salivating….! and thank you very much for I had the opportunity to publish my work. Anonymous 1: Sometimes we prefer tuna steaks and mackerel steaks over catfish because of that reason. Give those a try! Anyonymous 2: We feel the same way about ca kho to…love the sauce…we'll do our best to keep on making you salivate! Test: thanks for sharing the recipe. I've been looking for a recipe like this! where can I find the coco caramel jar in/around San Francisco? I just moved here so I'm not that familiar with all the grocery stores. Thanks and great website! Linda: If you can't find it in your Asian grocer, it's easy to make your own. All you need is sugar and water. Use about 2 tbs of sugar and 1/4 cup and keep at a rolling simmer, stirring until it reduces and becomes dark brown, about 8min or so. It should be around maple syrup like consistency. If too thick, just add more water. Simply delicious – I'll be sure to make this. In Vietnam, would they eat this dish with herbs? Nii: In typical family dinners, meat/fish dish such as ca kho to is eatened with any variety of soup, such as canh tan o and a side of veggies such as mustard greens or pickled vegetables (do chua). Generally, this isn't eatened with herbs (perilla, mint, rau ram) like noodle soups. my mother used to make a huge pot of this dish for me, because i'm a huge fan of leftovers and i could eat this pretty much everyday for a week. she used sardine fish, stewing them for such an amount of time that the bones became so tender, they'd melt in your mouth. my grandfather used to serve this with rice porridge for breakfast. this post so brought back memories! angry asian: same here! the left overs of this dish is still so good…thanks for sharing your family traditions! Just had this for lunch at Vung Tao II in Milpitas (delicious!) and I was looking for a recipe to try. Look forward to checking it out. KRon: Thank you so much for the feedback–it's comments like yours that really make this blog and sharing recipes enjoyable! 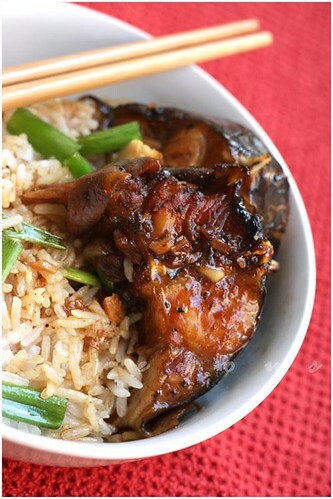 The sweet, savory and gooey goodness of the caramelized sauce of this dish is almost good enough to stand on it's own mixed with plenty of jasmine rice. Hi, i am just wondering how do you do with the new claypot without cracking? Thanks. Thanks for the link, it's so helpful. Anyway, your ca kho make me mouth watering, all your recipes are look good. Thanks again for the recipes and claypot information. This is a fantastic, yummy to see this blog, good food, O i feel hungry now, let me have one please, Thanks for share this Yummy post. One of my favorite Vietnamese dishes, but I find it almost impossible to find it in restaurants in Montréal. I feel like I'm doing my culture a service by finding this recipe, just wish my father had taught me before, like the language. Not usually a huge fish fan, but I've always wanted to make this. I am so glad to have stumbled upon your blog! I wanna run to the nearest Lee Lee and make some of these recipes. The information about the Ca Kho To Vietnamese Braised Fish in Clay Pot is one that has so much as for information I think that the given information is really good and from the pictures even it look great. Cooking covers both the necessity to eat and the desire for variety in what is eaten. A combination of taste, sight and nutrition requirements come together in subtle ways to make each meal different. The Vietnamese Braised Fish in Clay Pot, is some thing nice for eating and I think this this is a thing which always has a test that peoples does like eating it. Hmmmm!! !thanks for this most delicious and tasty meal article,specially for all pictures you share. Anonymous, I used to sub coconut juice for coconut milk and water too…and the dish would always come out really weird as a result! do i need a claypot? a regular pot will work? I don’t really like catfish because it has a muddy taste to it, but make this dish with monkfish and it’s fantastic! How many servings does this make? Two people or four? THANKS! Thanks so much! One more question. Do I put all the marinade in the pot with the fish, or just lift the fish out and into the pot? Seems like a ton of garlic! Thanks!! This is one of my all time favourites. The recipe is so simple that I had to give it a try. I couldn’t find catfish so used basa fish and cooked in a regular pot. It turned out great. I won’t be ordering this dish at the restaurant anymore!!! The next time I cook this dish, I will cut back on the fish sauce and replace with salt to reduce the fishy smell. It took a whole day for the house smell fresh again :-). Thank you for sharing the recipe!! yes, or you can find coco soda. This was the first dish I have ever cooked. So obviously I followed your recipe down to the T! My boyfriend was absolutely amazed by how delicious it came out. I love the Ravenous Couple for inspiring me to start cooking! Thanks for sharing!!! Hi there, if I can’t find catfish steak, can I use catfish fillet? Also can you tell us more about how to add the pork belly with it? Thanksss, am making it tonight, so excited! Sweeet thanks, and my god you guys are so fast with reply! <3 your site! I was not able to find young coconut juice at my local asian grocery store. They did, however, have coconut juice. Will this work? Thank you for sharing such a great recipe! yes, it will, some people even use water or 7 up! Hi, thanks for the recipe! Very tasty! I just want to confirm – the recipe calls for 1 tablespoon of pepper. Is this correct or should it be 1 teaspoon? My husband LOVES this dish. Im going to try this, will catfish fillets work? We live in a small town and i cant find any fish steaks anywhere!! Thank you for the awesome recipe! My husband and I had braised catfish at a little restaurant in Westminster, CA just yesterday. I am eager to try this recipe asap! My only concern is our neighbor downstairs, haha. This will be stinky and I want to simmer til the bones are edible! Kudos on the beautiful photography too! Thank you!! I did it with the fillets my husband loved it, i just had to be careful because they were very tender. But overall great recipe!! I had this at a restaurant and really didn’t know what I was ordering…When my food was delivered and I realized that it was catfish I was mad that I was paying 15.00 for my food..I thought “I can make this and catfish is on sale!!”. I went home and looked for a recipe and found your site. Thank you for helping me save my money..
A picture of my plate. Was delicious!! What is juice of young coconut ? Is that what we refer to as coconut water or extract from the coconut flesh aka cocnut milk? yes, coconut water. not coconut milk. Hi Ravenous Couple! Both of my parents lived their younger years in Vietnam so we are always eating Vietnamese at home. My grandmother used to kho ca for me all the time before she passed and recently I came into possession of her old clay pot. I found your recipe and I really want to give it a try, but I’m kind of lost on how this would be made in a clay pot. Will the fish sear the same way in a clay pot as in a pan? Can all of your above steps be done in the clay pot? I love that the two of you are so passionate about Vietnamese cuisine, and really appreciate you sharing all your recipes. Thanks! that’s a fantastic keep sake. yes, you can do it all in the clay pot. I really loved this, but this fish completely fell apart while it was cooking. So it tasted good, but looked kind of gross because it was all crumbly. Is that normal? How do you avoid that? I used halibut; not sure if that makes a difference. yes, some fish wont’ work well esp if they are “lighter” flakier fishes that can’t take a longer braise. meatier, and fattier fish works better. Do you pour the fish and all marinade in pot in the final step? Perfect recipe for Fridays during Lent. Thanks for sharing. If I didn’t have a clay pot, can I just use a regular non stick pot? Can I use regular sugar instead of brown sugar? Last but not least, can I use coco rico soda instead of young coconut juice? yes, a regular heavy pot such as enamel work great. yes, white sugar is actually good to use as it caramelizes nicely. coco rico is an adequate substitute. Hi! I just purchased my first clay pot today. The one I bought had a metal wire type thing around it, am I suppose to take the wire off or leave it on? Can I use catfish filets? I have a bunch I need to use up. I just made this and it was amazing!!! Thank you for sharing this recipe. This is one of my favorite comfort food Vietnamese dishes and you guys made it so easy to make and it was delicious! Thanks!